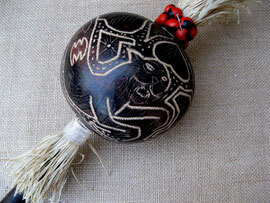 Calabash - ARTE AMAZONIA provides a global voice through art for the indigenous cultures of the Amazon. 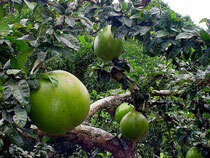 of the calabash tree grown native to South America, which can either be harvested young and used as a vegetable or harvested mature to be dried, decorated and used as a container, bowl, utensil, music instrument, pipe, jewellery and more. 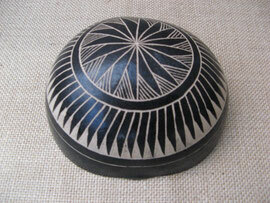 Explore our selection of traditionally inspiried objects including bowls, shakers, eggs and earrings made from calabash. 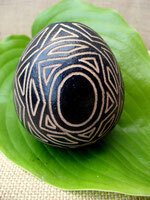 These unique pieces are handmade by the local artisians in Peru, Brazil and Equador from an ideal sustainable source. FLAAR Reports traveled to Rabinal, Baja Verapaz, Guatemala to meet with Olga Garniga, a local Maya artisan who taught us the ancient tradition of Calabash Craftsmanship. 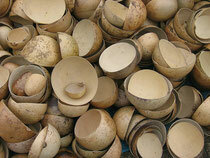 In the video above you will learn the materials and process used to transform calabash fruit into beautiful works of art. The artisan's tradition which is found throughout central and South America is quickly disappearing and this video is an effort to document the long process of Calabash Craftsmanship. The Foundation for Latin American Anthropological Research is better known as FLAAR. Our mission includes research, education and outreach of how digital imaging technologies can record our visual links to the past, present and future, especially related to pre-Columbian cultures of Mesoamerica.